Born 1964 into a family of artists, Tim's father Michael Hall trained at The Royal college and his mother Brenda Hall has shown at the Royal academy and taught art for over twenty years in addition to this Tim's elder sister Robin Hall attended St. Martins and has a successful career painting. 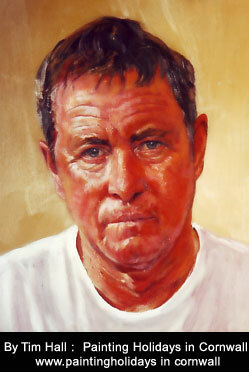 After completing a degree in Fine Art from Kingston Art College in 1989 Tim worked in the art department of Shepperton and Pinewood film studios, he maintained his painting and took on some prestigious public and private commissions, notably a monumental piece for Air Products HQ, actors John Nettles, Peter Farrell and Brian Burden and business tycoon Gary Blackburn with family. Subsequently Tim taught art for eight years before moving from Esher to Cornwall, there he has opened his own painting holidays school and concentrated on the Cornish sea and landscape. The Sandpiper Gallery, Cornwall 2006.